We talk a lot about what we can do to become more resilient, to be able to be able to withstand unexpected setbacks and continue living in relative safety and comfort. 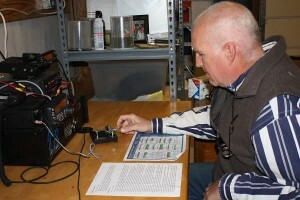 We’re taking another step now, as I learn to use Morse Code on my ham radio. I became a licensed amateur radio operator – call sign AK4IF – more than two years ago and immediately invested in a small two-meter radio. Since then, however, I honestly haven’t used it much, just enough to satisfy myself that the equipment worked. When our friend Tom Bray sold us his HF radio, though, I began to spend more time and become more comfortable with what ham radio can do. The most resilient form of radio communication by far is Morse Code – the hams call it CW. CW focuses all its energy in a very narrow band and therefore travels farther on very low power. Also, there is something about the way human hearing works that allows us to distinguish the dits and dahs of the code in the presence of a great deal of interference when we wouldn’t have any chance of understanding human speech. Nevertheless, I shied away from learning Morse code at first because it just seemed so intimidating. 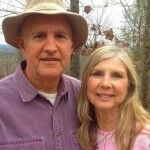 But when another friend, James Estes, talked repeatedly about how much fun he was having using CW, I slowly decided that I had run out of excuses. I have now learned the code. My pace, as you’ll hear in the podcast, is painfully slow. But I’m confident my speed will improve as I continue to use it. Hams talk about their equipment more than Californians talk about their diets, so here’s mine: My 2-meter radio (for almost noise-free close-in communication) is an Icom 2720H. Its signal runs through a Diamond X50A fiberglass antenna mounted close to the ground just north of the barn. My HF radio is a Kenwood TS-480SAT. Its signal runs through a Hustler 5BTV vertical antenna that’s also mounted just north of the barn. I don’t have nearly enough radials (the wires running out on the ground from it like spokes on a wheel), but that too will come with time. 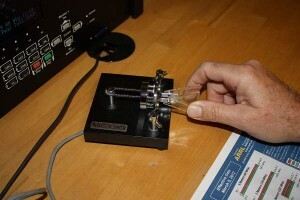 The Iambic paddle I’m using for sending Morse code is a Bencher BY-1. Both radios are portables, simply because they were available at a good price. I never move them. All my equipment was purchased used at a fraction of the retail price. Here’s the post I wrote two years ago when I first obtained my license. And its only tangentially related, but here’s what I had to say then about my study to pass the license tests. Previous Previous post: Podcast #211 – Goodbye Summer!